During Derby season in Louisville, Kentucky, you hear a lot of talk about Pegasus Pins. They're an essential part of the Kentucky Derby Festival, a series of more than 70 events occurring two weeks prior to the race to get everyone in a festive Derby mood. The celebration is organized by a private non-profit organization that carries the same name, and it's the group that doles out the pins each year. Pegasus Pins are purchased by Derby fans to fund some of the Derby Festival, and they're worn to show support of the Derby at large. 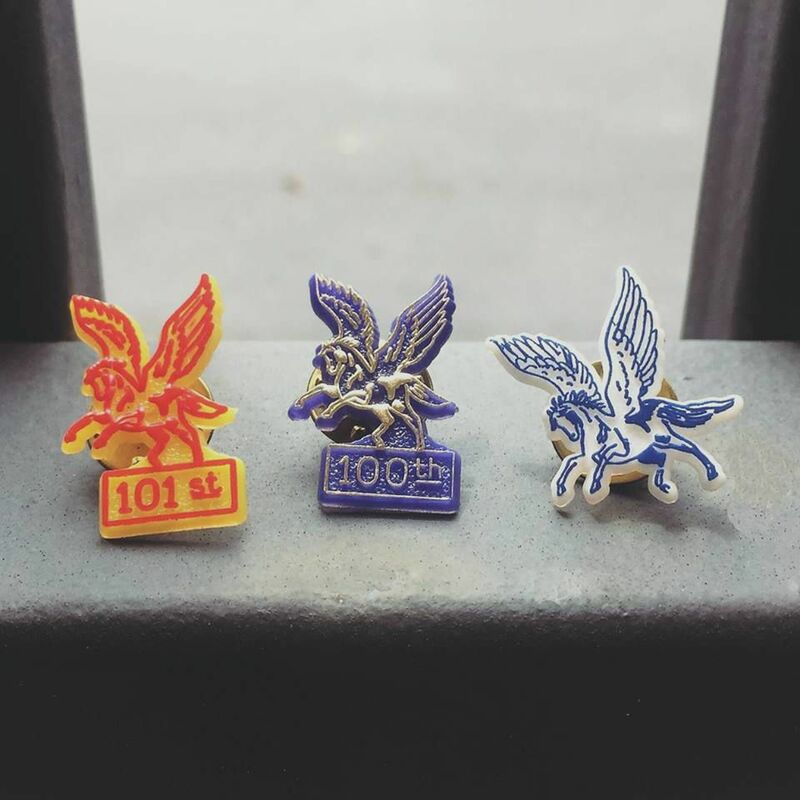 More than 200,000 Pegasus Pins are sold each year, and that number keeps on growing. Purchasers of the pins are granted free access to over 30 festival events, including the Great Balloon events and the parade preview party. A Pegasus Pin is required to enter Kroger’s Fest-A-Ville, a 900,000-square-foot site with carnival rides, an inflatable playground, helicopter rides, a stage that hosts big-name concerts, and special events like the Ohio Valley Wrestling Run for the Ropes, the V Foundation Celebrity Bocce Tournament, and BeerFest Presented by Liberty Financial, among others. Pin-wearers in Kroger's Fest-A-Ville also have access to a daily happy hour that serves $2 beers. If you are shopping in and around Louisville between March and May, Pegasus Pins will be hard to miss. They are sold at over 1,000 retail outlets and other institutions throughout the region, including Belle of Louisville, Circle K, Class Act Federal Credit Union, CVS, Derby Dinner Playhouse, Fifth Third Bank, Frank Otte Nursery, Kroger, Louisville Science Center, Louisville Visitors Center, Rite Aid, Southern Indiana Tourism Bureau, The Company Store at Yum!, U.S. Bank, ValuMarket, Walgreens, and many, many more. You can also buy Pegasus Pins online prior to the Kentucky Derby Festival at kdf.org. Some special pins are also given out to attendees of certain events. Individual pins range in price, but they start at $6 for the standard plastic pin when you purchase it in advance. If you buy them at an event during the festival, they could cost more. There are also deals for buying multiples: for example, family packs of five pins are usually available, and they cost less than if you buy five pins individually. And finally, there are also special metal pins for individual events that start at $8. The sales from the pins go directly to the Kentucky Derby Festival, and they contribute to 20 percent of the event's budget, allowing a number of events like Thunder Over Louisville, the first event of Derby season, to be free to the public. The pins look different each year, so they've become a popular collector's item. There are also specific pins for individuals participating in certain events such as the Great Balloon Race, which are more limited in supply. If you are interested in pin collecting, there are pin trading events happening during Derby season: check out the trading schedule at the Pegasus Pin page. Many pin collectors also buy them on the secondhand market through sites like eBay.